With all the talk about bison injuries in Yellowstone (Stay away from them! They’re faster than you! ), I thought I’d hit on a safety topic in my favorite national park. I LOVE the Grand Canyon. I admit it. It’s kind of like a first love for me – I fondly remember its beauty and splendor and yet long for the fun and happy times spent there. I don’t know what it is about the canyon that draws me – the vibrant colors, the carving river, or the fact that’s it a giant chasm in the earth. I first saw the canyon in 2008 when a change in vacation plans allowed me to spend four hours at the north rim. I can still remember how I felt gazing upon that rim for the first time. I was speechless. As a national park, the Grand Canyon is left to its amazing, natural state. In these parks, visitors inherently take the risks that come with being in a ‘wild’ area. However, too many people don’t take these risks seriously. Whether in the backcountry or simply at the rim, you have to be prepared and be safe. Not too long ago, I read the book Over the Edge:Death in Grand Canyon by Michael P. Ghiglieri and Thomas M. Myers; a book that most people find morbid, I felt was actually very interesting and educational. 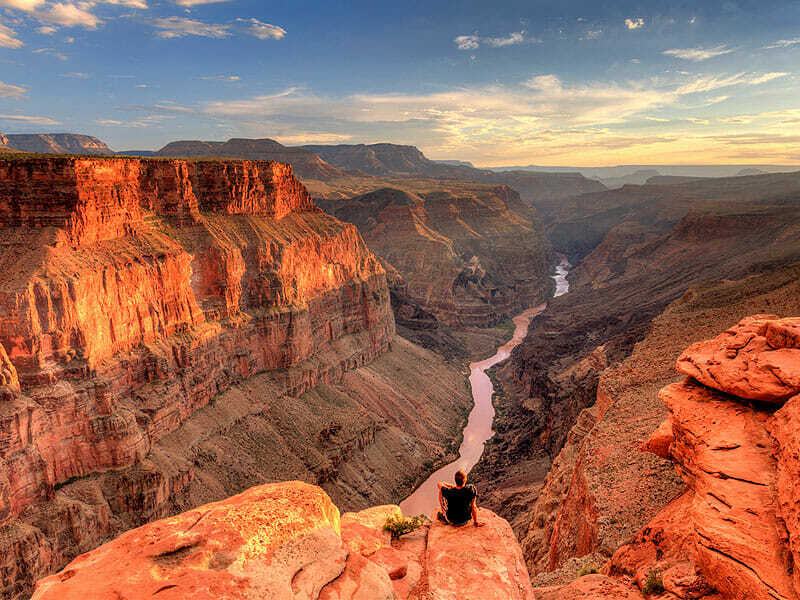 Grand Canyon statistics show that on average, 2-3 people die there each year from falls at the rim. Reportedly, there have already been 2 deaths from falls in 2015 already. If you fall from the rim, you will likely die. Despite all the guard rails, signs, and ranger warnings, people don’t seem to take their safety seriously. When hiking in these national parks, you need to pack your common sense. Falls don’t just happen from the rim. They are also common from within the canyon. Climbing peaks, hiking ledges, and rock scrambling, especially with weighted backpacks, can be perilous. Taking photographs – People will try anything to get the perfect shot. Walking way out to ledges or dangerous cliffs is not smart. Even telling people posing for a photo to “back up just a little bit,” while standing on the rim has been known to prove deadly. Goofing off while posing for photos (“Look! I’m falling!”) also comes with its own perils. Crossing retaining walls or guard rails – These guard rails are there for a reason. If you walk or climb anywhere past them, you are not guaranteed safe ground. Crumbling rock and unstable ground has given away in the Grand Canyon before and will do so again. Walking off the trail – Just like the guard rails, the trails are safe areas to hike. As soon as you leave a trail, you take a risk. Jumping rock to rock or ledge to ledge – Self-explanatory. Use your head. Dizziness – Sometimes the vastness of the canyon can be overwhelming. Don’t sit right on the edge and get up quickly. This can result in a drop in blood pressure and cause instability. Dehydration (from heat, exercise, or too much alcohol) and older age also contribute to dizziness. Snow and ice – I’m sure there are some people who hike around and within the canyon when there is snow and ice, but it seems way too risky. Icy trails and thousand foot drop-offs don’t mix. Leave that to the professionals. Hiking at night – Yes, hiking can be done at night, but it certainly isn’t recommended. Between the darkness and vastness of the canyon, you can easily get disoriented and not know where you are. At the very least, please hike with a headlamp and walk slowly to assure yourself of your footing. All of this information can be applied to any national park. 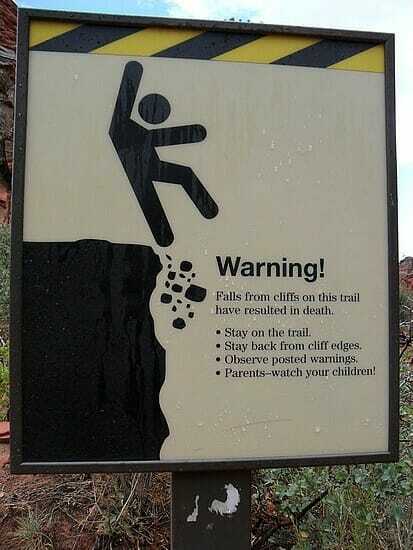 Yosemite, Yellowstone, and some state and national parks involve some degree of danger from falling. Don’t let the wonder of these parks dampen your ability to see these risks. Use your head – Know what you are physically able to do and use your common sense. Read the signs – They are warnings to you in dangerous areas! Listen to the park rangers – They will be the ones risking their own lives to come out and save you if necessary. They know the park better than you. Respect the park – The canyon is a wild place. Respect its power and majesty. I’d love to hear your thoughts on this. Leave a comment! That was real informative. I appreciate the way you like to reassure people’s safety. It is a breathtaking sight. I hope we both can see it again. P.S. Also if anyone else is reading this go check out Soarellem on YouTube. That’s me. I have been surprised in many of the parks with canyons and ledges to see what people do. Walking out on ledges to get that photos, climbing over barriers, running down trails with loose scree… Oy! It is a frequent topic of conversation with my husband and I when we are traveling. My healthy fear of heights comes in handy, I suppose but I am more than happy standing a good distance from the edge – the pictures aren’t any better 10 feet closer!